Yannick Noah is a former professional tennis player who is best known as the winner of the French Open in 1983 and later as the captain of the French Davis Cup and Fed Cup teams. After his tennis career ended Noah became a well-known pop singer and co-founder of Fête le Mur in 1996, a charity organization for underprivileged children. Noah was born in Sedan in northern France on May 18, 1960. His father, Zacharie Noah, was a prominent soccer player from the Cameroons who won the French Cup while playing for Sedan. His mother, Marie-Claire Perrier, was a former captain of France’s basketball team and a teacher in Sedan. In 1963, the Noah family, which now included Yannick and his two sisters, Isabelle and Nathalie, moved to Yaoundé, the capital of Cameroon. Here Noah discovered his passion, tennis. In 1971 when Noah was 11, his talent and energy impressed American tennis player Arthur Ashe who was on a visit to Cameroon. Before leaving Yaoundé, he gave young Noah his tennis racket. Soon afterwards Noah was sent to France to begin intense training at the French Tennis Federation’s training center in Nice. From 1976 to 1977 as an amateur and later from 1977 to 1996 as a professional Noah charted an impressive career. After winning his first major tennis title in Manila, Philippines in 1978, he won 23 singles titles over his career. His major achievement came in June 1983 when the 23-year-old defeated Mats Wilander at the Roland-Garros (French Open) Tournament in Paris. He became the first Frenchman to win the title since 1946. He was also the first black man to win the title. In 1986, he ranked 3rd internationally among professional tennis players in the singles category. In 1986 he ranked 1st in the doubles category. No French player has achieved these ranks since then. In 1991 Noah became the captain and coach for the French team that competed for the Davis Cup. His team won that year against a U.S. team led by Pete Sampras. The French team added another championship victory in 1996 against Sweden. Noah also led the French women’s team that won the Fed Cup in 1997. Also in 1991, Noah began a career as a singer with his song "Saga Africa." For the next decade he recorded a number of African and Caribbean styled albums which generated concert tours across France and the rest of Europe. Despite a decline in his popularity at the beginning of the 21st Century, he had a successful tour in 2010 that ended in the Stadium of France outside Paris before 80,000 fans. Yannick Noah has been married three times, first in 1984 to Cecilia Rodhe who was Miss Sweden 1978. She is the mother of his son Joakim (1985), who is now a player with the Chicago (Illinois) Bulls of the National Basketball Association (NBA), and his daughter Yéléna (1987). In 1995 he married Heather Stewart-Whyte, a British model with whom he had two daughters, Eleejah (1996) and Jeneye (1997). Since 2003, his companion has been Isabelle Camus, a French television producer. They have a son, Joalukas, born in 2004. 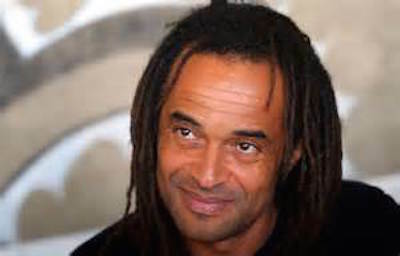 “Yannick Noah,” Association of Tennis Professionals, http://atpworldtour.com/Tennis/Players/N022.aspx; Yannick Noah Official Website, http://www.yannicknoah.com/; “Yannick Noah,” International Tennis Hall of Fame, https://www.tennisfame.com/hall-of-famers/yannick-noah; Yannick Noah Biography as a pop musician, Radio France Internationale, http://www.rfimusique.com/artiste/chanson/yannick-noah/biographie.